Police say they have made progress in their investigations into Saturday's bomb blasts in the Indian capital Delhi which killed 59 people and injured 210. They also say it is likely that one group was behind all three attacks. Heavy security is in place across India ahead of two major religious festivals which take place next week. A previously little-known group called Inqilabi has said it carried out the attacks. Police say they are trying to verify the claim. "From the timing, it seems the same group was behind all three cases," Karnail Singh, joint commissioner of police, told a news conference in Delhi. A number of people have been questioned but no arrests have been made as yet, Mr Singh said. The three blasts came within minutes of each other at dusk on Saturday, when many people were out shopping ahead of the Hindu festival of Diwali and the Muslim Eid celebration. Two of the explosions ripped through crowded markets. A third exploded on a bus but killed no-one, police say. Police have raided guest houses and hotels in Delhi for clues. Home Minister Shivraj Patil said "lots of information" had been gathered, but refused to give details. "Our people are making good progress. The investigation is going well," he said after an emergency cabinet meeting on Sunday. All leave has been cancelled for medical staff as hospitals struggle to deal with the injured. More than 100 people are being treated, some of them in critical condition. Prime Minister Manmohan Singh has visited victims in hospital and has held emergency talks with top security advisers. Security officials said they could not rule out the involvement of Lashkar-e-Toiba, one of the leading groups fighting Indian rule in Kashmir. Pakistan condemned the explosions as a "criminal act of terrorism". 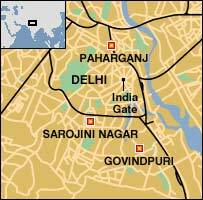 Police said on Sunday that 43 of the 59 people confirmed dead perished in the blast at Sarojini Nagar. A further 16 died in the first explosion, minutes before, in the crowded central neighbourhood of Paharganj, close to Delhi's main railway station. The third blast, at Govindpuri, killed no one but the bus driver and his conductor were seriously injured, reports said.